This page describes the process for becoming a professed Secular Franciscan and the three stages of formation. The third stage, Candidacy, is the final formal period of initiation. It is a time of preparing for permanent commitment by immersion into fraternity life. Central to this stage of formation is Article 4 of The Rule of the Secular Franciscan Order which states, “The rule and life of the Secular Franciscan is this: to observe the gospel of our Lord Jesus Christ by following Saint Francis of Assisi, who made Christ the inspiration and the center of his life with God and people.” The period of Candidacy is a minimum of eighteen months and culminates in permanent commitment to the gospel life. Those in initial formation are expected to attend fraternity and formation meetings. Participation in the meetings of the local fraternity is an indispensable presupposition for initiation into community prayer and into fraternity life. General Constitutions SFO, 40, 3. The National Formation Manual, For Up to Now (FUN) was presented to the Regional Formation Directors at a national meeting in May, 2011, Then the Regional Formation Director for St. Joan of Arc Region gave a weekend workshop for local formation directors on the manual to explain the material and how to use it. The fraternity watched all the DVD’s one summer, and then in the fall, at our regular fraternity meetings, all professed members plus others present started studying the FUN manual (beginning with Lesson One under Candidacy), a book entitled The Franciscan Journey and other recommended material. We followed the model format given to us by the Region. Inquirers and Candidates also used the manual and book, following the model format and meeting at a separate time (although present at the fraternity meeting). The FUN manual may be ordered here: http://iqfastprint.com/sfo/for-up-to-now.html or call (636) 281-2129. FUN manual 5/12/11: click FUN MANUAL to view this manual. Model formation program 5/12/11: click 2011 Model Formation Program to view. 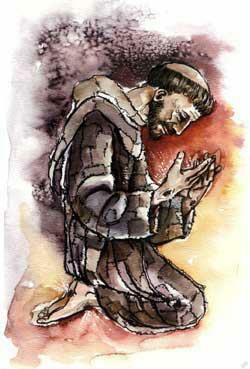 The Franciscan Journey may be ordered from Smoky Valley Printing at (785) 277-2364. See inside cover of TAU magazine. We have many of the suggested readings in the model format, and if so, a few at a time may be e-mailed to you. Go to our Contact page to make a request. After we finished the FUN manual, in the fall of 2015, we began studying another book on the Rule: To Set Themselves Free by Teresa V. Baker, OFS. It also may be ordered from Smoky Valley Printing at (785) 277-2364. This book was recommended by Anne Mulqueen in an article she wrote for TAU magazine. Click on the Profession webpage in the Secular Franciscan dropdown menu above as it has to do with formation also.